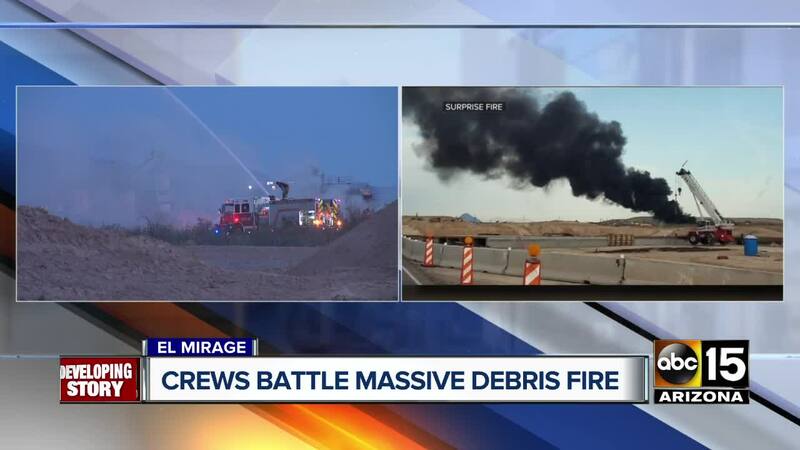 EL MIRAGE, AZ — Authorities say a large debris fire in El Mirage west of Phoenix has been brought under control. Black smoke could be seen for miles after the blaze broke out around 5 p.m. Saturday. Rural Metro Fire Department officials say crews from El Mirage, Peoria and Luke Air Force Base helped battle the blaze and get it under control within three hours. They say the fire appeared to originate near a homeless encampment on private property and burned tires and debris such as boat parts, old hot tubs and other trash. Authorities say the cause of the fire is under investigation. Firefighters initially had trouble containing the blaze due to a lack of a water supply in the area. Officials said no structures were threatened or involved.